Agar Scientific supplies graphene oxide support films for transmission electron microscopy (TEM). Graphene oxide offers a thinner support film, with a higher electrical and thermal conductivity and higher mechanical strength compared to support films manufactured from other materials. Agar graphene oxide support films are manufactured using a special application technique. They are hydrophilic and suitable for imaging small nanowires, nanoparticles, and suspensions. The thin-layer thickness and low atomic number of graphene oxide support films result in lower background contrast than traditional support films. The vitreous ice layer can be considerably thinner and provides higher contrast and higher resolution for structural determination. 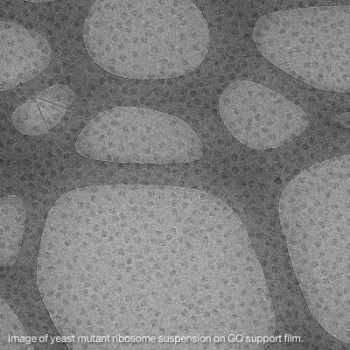 Agar graphene oxide support films are suitable for Cryo–TEM analysis and can be applied to other grid sizes, material or type. They are available as graphene oxide support film on Lacey carbon on 400-mesh Cu grids (pack of 25), and graphene oxide support film on Quantifoil R2/2 on 300-mesh Cu grids (pack of 10).